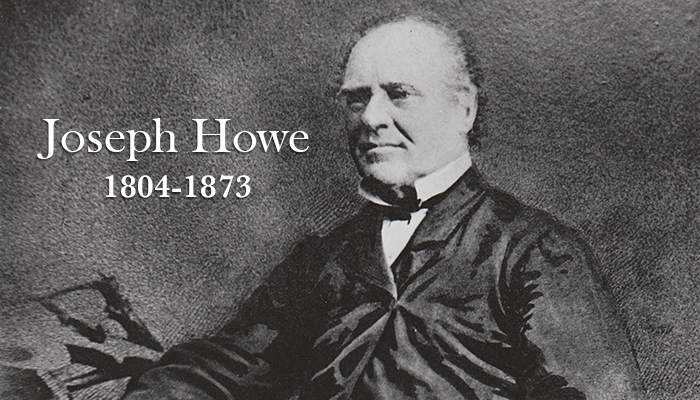 Perhaps no one shaped Nova Scotian politics, literature or freedom of the press more than Joseph Howe. He expressed his love for the province in all he did, from the push for responsible government to his Halifax inspired poetry, such as the Ode to the Town Clock (1836). As publisher of The Novascotian, a spirited and popular newspaper with commentaries on the day’s events, Howe loyally promoted notable Nova Scotian literature, including the first of Judge Thomas Chandler Haliburton’s Sam Slick series. Haliburton was a regular contributor to the paper, and would become one of Nova Scotia’s greatest satirical writers. Both Howe and Haliburton were members of an informal literary group, known simply as “The Club”. Today, Howe’s printing press rests at the Nova Scotia Archives. Howe is perhaps best known for his rousing speeches. In particular, his famous 1835 defense of free speech for the press. Howe had been accused of libel for comments found in The Novascotian towards the magistrates. He was called before the court, and as no lawyer would defend him, Howe represented himself. He spoke to the court for two days, and after a short deliberation, was acquitted of all charges. The event is commemorated on a statue of Howe located next to Nova Scotia Province House. At the base is a bronze plaque showing the newspaper publisher addressing the court. Howe eventually became a member of the Legislature in 1836, then Premier from 1860-1863, and then finally, a federal cabinet minister. He was appointed Lieutenant Governor for a short time before his death in 1873 and now lies buried beneath a slab of Nova Scotian granite in Camp Hill Cemetery. Many of Howe’s speeches, poetry and travel accounts were published after his death, much to the delight of his admirers. This incredible online exhibit from the Nova Scotia Archives is a digitized scrapbook created by Joseph Howe’s son, Sydenham. The collection of family memorabilia includes letters and documents from the early 1800s to 1900s that belonged to Joseph Howe. Created through a partnership between the Nova Scotia Museum and the Nova Scotia Archives, this online resource provides virtual museum artifacts and archival documents that relate to Joseph Howe so that students can examine the real thing and teachers can create a museum experience in their classroom. In honour of Joseph Howe, the Nova Scotia Museum has prepared an Infosheet about his background and his impact on this province. Infosheets are part of the Nova Scotia Museum ePublications program and are intended to advance understanding of important subjects and encourage research by others. Halifax Municipal Archives invites Nova Scotians to view its Honouring Joseph Howe and Remembering the Joseph Howe Festival virtual exhibit. Each fall from 1973 to 1985, Haligonians paraded in Victorian costume through the Public Gardens; held public-speaking contests in Province House; raced boats in the Harbour, and soap-boxes in the streets; and drank beer from souvenir Joe Howe mugs paid for by “Joseph Howe Trade Dollars” – all to celebrate the city’s famed wordsmith. This small exhibit is part of a large archival access project funded through the Nova Scotia Department of Communities, Culture and Heritage Provincial Archival Development Program. The list of materials below, including books, videos and other resources, are available through public libraries across Nova Scotia. Please contact your local public library to borrow these or to find further resources that are available. Joseph Howe / J. Murray Beck. by Beck, J. Murray 1914- Kingston [Ont.] : McGill-Queen's University Press, 1982-1983. Joseph Howe / by G. M. Grant. Halifax, N.S. : A. & W. Mackinlay, 1906. Joseph Howe & the battle for freedom of speech / John Ralston Saul. Kentville, N.S. : Gaspereau Press, 2006. Joseph Howe of Nova Scotia / by Bruce Fergusson. Fergusson, Charles Bruce, 1911-1978. Windsor, N.S. : Lancelot Press, 1973. Joseph Howe: opportunist? man of vision? frustrated politician? / edited by George A. Rawlyk. Toronto : Copp Clark, c1967. Parliamentary democracy in Nova Scotia: how it began, how it evolved / [writing, Catherine Buckie]. Communications Nova Scotia, 2009. Three premiers of Nova Scotia: the Hon. J. W. Johnstone, the Hon. Joseph Howe, the Hon. Charles Tupper / by Edward Manning Saunders. Toronto: W. Briggs, c1909. Today's Joe Howe: "the greatest Nova Scotian" / by Trevor J. Adams and Michael Bawtree; with foreword by John Ralston Saul. Halifax, N.S. : Joseph Howe Initiative, c2004. Joe Howe: the man who was Nova Scotia / by Kay Hill. McClelland and Stewart, c1980. Joe Howe to the rescue / Michael Bawtree; illustrations by David Preston Smith. Halifax N.S. : Nimbus Pub., c2004. The heart of Howe: selections from the letters and speeches of Joseph Howe / edited by D.C. Harvey with a foreword by Angus L. MacDonald. Toronto: Oxford University Press, 1939. Joseph Howe: voice of Nova Scotia / a selection, edited and with an introduction by J. Murray Beck. Howe, Joseph, 1804-1873. McClelland and Stewart, 1964. My dear Susan Ann: letters of Joseph Howe to his wife 1829-1836 / [edited by] M.G. Parks. by Howe, Joseph, 1804-1873. St. John's, Nfld. : Jesperson Press, 1985. Poems and essays / Joseph Howe; introduction by M.G. Parks. by Howe, Joseph, 1804-1873. Toronto: University of Toronto Press, c1973. Western and eastern rambles: travel sketches of Nova Scotia / Joseph Howe; edited by M. C. Parks. Howe, Joseph, 1804-1873. University of Toronto Press, 1973.